Replay Video Capture is a video capture software that can provide a satisfactory quality of rendering up to 50 FPS. Method of process: this software makes video captures as a background task without disrupting the activities of the user. It is even possible to reduce its immediate window and to operate in stealth mode. 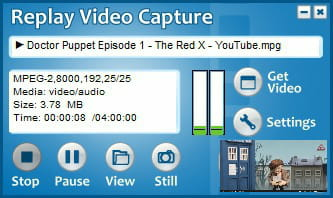 Capture mode: Replay Video Capture is able to capture a specific area of the screen, or even a whole window. The user can however choose a part of the desktop by performing a few simple configurations. Programmable: an option included in the programme allows to automate operations in such a way that it runs alone after a moment previously determined by the user. The video size can be set in the case where the sound card does not support recording. It has a simplified and an ergonomic interface which make it easier to use. Latest update on July 22, 2015 at 07:58 AM.